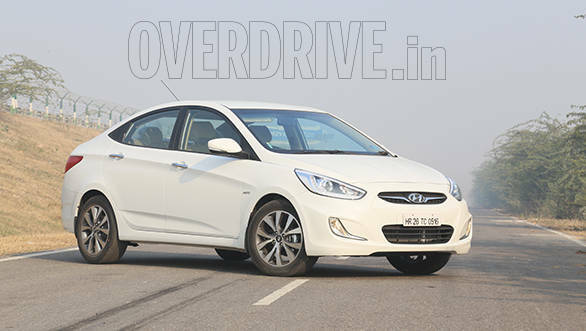 The Hyundai Verna has undergone a midlife makeover that packs some surprises - pleasant and unpleasant. In 2011, the Hyundai Verna proved that a good looking design has the ability to turn around the fortunes of a product-line that hasn't really enjoyed an enviable legacy. Hyundai's fluidic-sculpture design philosophy worked so well, that the Verna did the unthinkable and went on to become the leader of the C-segment - an area in which it had hardly made any noise in the past. It's been three years since this transformation and in today's scheme of things, it was now time for the Verna to get its midlife makeover. More so, since the all-new Honda City is here with the much-awaited diesel variant. In fact, by the time you read this review, the Korean carmaker's factory at Sriperumbadur would have already started shipping out the 2014 Hyundai Verna facelift to its wide dealership network. The most notable difference on the facelift is the face of the Verna itself. The swept-back headlights now feature projection-beam headlamps and impart aggression to the frontal design. The illumination levels have improved and get better throw and spread than what the multi-focal reflectors managed on the previous model. The new headlights come mated to automated function which switches them on when the surroundings go dark. The system also features the "follow-me-home" function, which leaves the headlamps switched-on for some time even after you have locked the car. We couldn't check either of these functions though as the headlights on our test car had developed some electrical glitch. 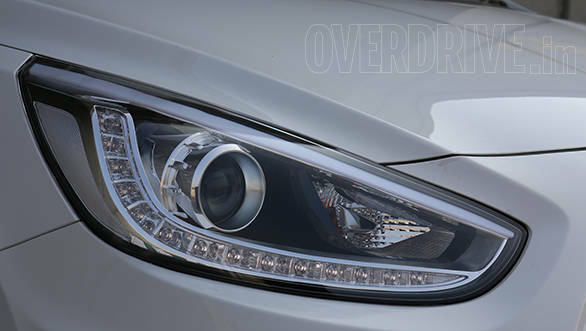 The headlights also get an array of LEDs underscoring them and these function as daytime-running lights (DRLs). These are an added safety feature in themselves, but their popularity has been high in our market purely for its cosmetic value. The LEDs are chunky and look appealing in the typical nightlife of a crowded metro. It also adds a hint of premium value to the Verna. Though the rest of the exterior is unchanged, the new headlights still managed to turn some heads during our drive in New Delhi. On the inside, there is one little change that only the eagle-eyed blokes may notice. There is now a blue backlight for steering mounted switches and the door-mounted switchgear for the powered windows. It isn't a noteworthy addition, but could come in handy. The electrical problems in our test car had affected these too. The rest of the elements in the cabin remain the same and so do the creature comforts. In fact, Hyundai tells us that even the engines are untouched. So you still get the same 1.6-litre petrol and diesel engine options and with a choice of automatic or manual transmissions (The 1.4-litre variants won't be offered with the new updated design). The 2014 Hyundai Verna facelift isn't purely a cosmetic upgrade over last year's model though. The Verna's suspension setup employs McPherson struts at the front and torsion beam at the back. We have often complained that this suspension is setup to provide excellent ride quality at city speeds but at the cost of handling dynamics. 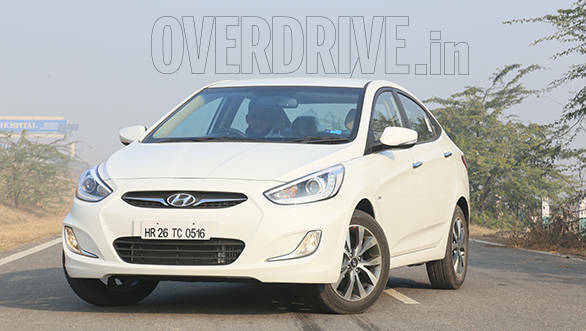 At highway speeds, the older Verna is nervous with a dead steering, wallowy dynamics and a bouncy ride. These problems have been addressed to an extent with the updated model. The Verna's suspension has now been optimised for better driving dynamics with a noticeably stiffer setup. The rebound has been tweaked for lesser bounce. The setup is not in the league of the Linea or the Fiesta, but the improvement is a welcome change. Grip around bends is good and the body-roll has reduced. The steering too has been tweaked. The unnerving play is gone and the unit weighs up well at high speeds. It still lacks feedback though and in-turn, the precision too. 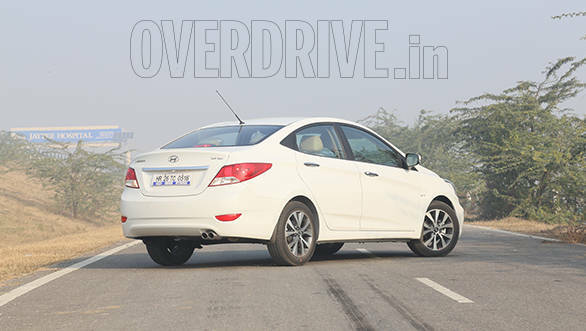 The car we sampled for this review was a Verna 1.6 SX CRDi AT which runs the 1.6-litre four-cylinder diesel engine mated to a 4-speed automatic transmission. 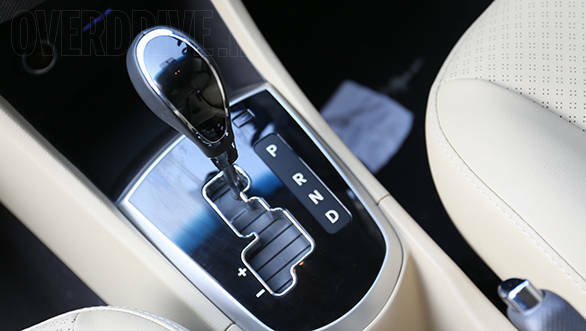 The engine puts out 128PS of power and 260Nm of torque and is still one of the most powerful engines in its category. Hyundai claims that this variant returns a fuel economy of 19.08kmpl, but our drive wasn't long enough to be able to give you an accurate real-world figure. We managed some acceleration runs though and a sprint from standstill to 100kmph took 10.7 seconds. The Verna had come to be known as one of the safest cars in its segment. 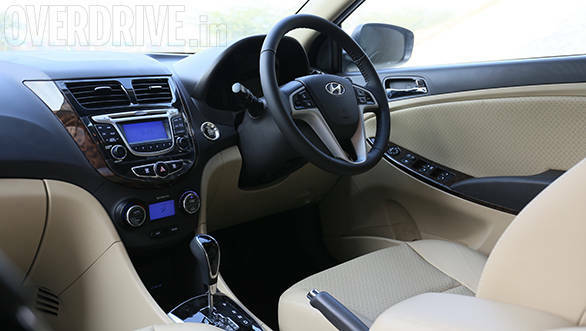 But with the 2014 model, Hyundai has unpleasantly surprised us by getting rid of the side and curtain airbags. 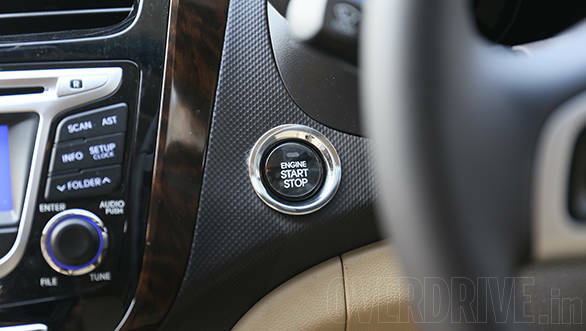 You can only get the driver and passenger airbags now, even on the range-topping SX trim. Thankfully, all the four wheels still ship with anti-lock disc brakes with EBD. We are told that a new trim level of the Verna is under works and will sit on top of the SX trim. It is expected to bring new features and creature comforts to the table. But until that happens, the 1.6 SX CRDi AT/MT is the best Verna that you can buy off the showroom. The improved handling and a slightly more premium touch to the exterior design, comes at the cost of the better safety equipment that the Verna had, as Hyundai has made no changes to the existing price range of Rs 7.4 lakh to 11.7 lakh. But the Verna remains one of our top recommendations out there as it still offers better bang for the buck than most of its competition.